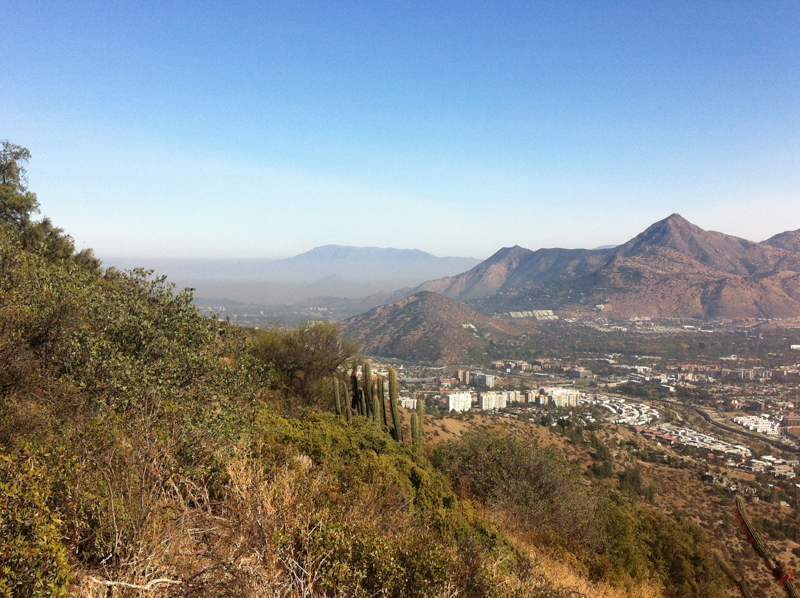 View towards Santiago from the hill above Andrew & Wendy’s – some of that smog clearly visible! Between the island trips, we rented an apartment right in the heart of the city, allowing us to properly experience the place and have a welcome dose of city life after many months in the wilds of Patagonia. Santiago felt like a comfortable place to live and get around, with the only major downside being the smog that envelops it during the winter. This is because the city is in a bowl surrounded by lots of hills, which means that the smog tends to get trapped in the city. We did experience the smog, but were there early enough not to see the worst. The fascinating Museum of Precolombian Art – having dodged erupting volcanoes in the south and seen the after effects of a tsunami on Robinson Crusoe Island, an emblem depicting the Mapuche people’s creation story particularly touched a chord. It shows a crocodile and a snake facing each other, representing the two conflicting forces of volcanos and tsunamis that shaped their experience of their land – volcanos creating land and tsunamis flooding it. The deeply moving Memorial Museum, remembering the atrocities of the Pinochet era. Catching the “Guillermo Nuñez at 85” exhibition at MAC (Museo de Arte Contemporáneo) that included a recreation, in the basement, of an installation he did at the beginning of the military dictatorship that served to get him arrested, detained and then sent to Europe in exile for many years. 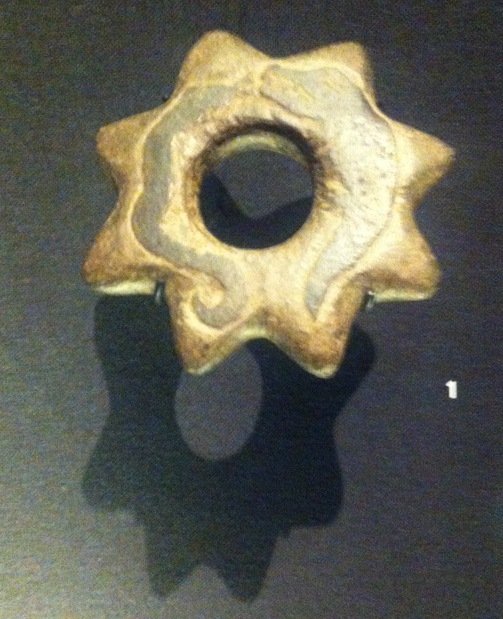 The pieces were all about loss of freedom, rights, etc. 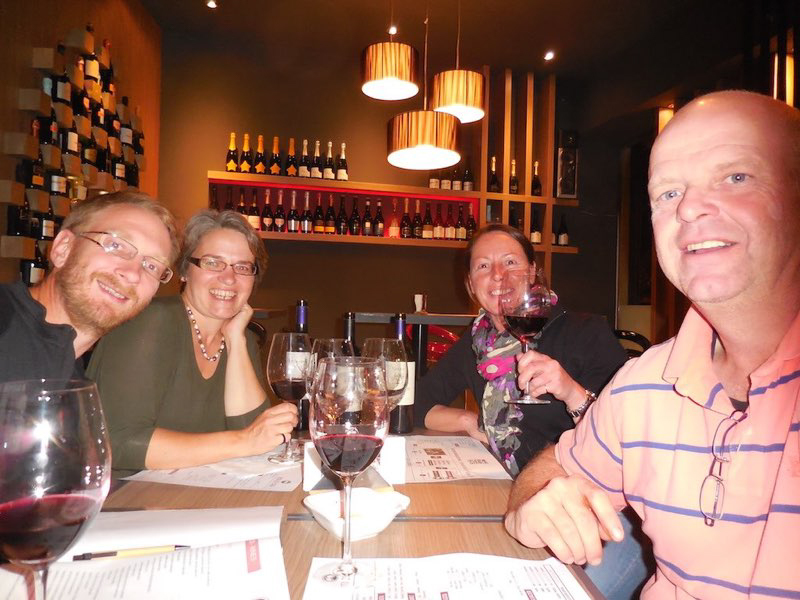 The best way we found to devote ourselves to the arduous task of tasting as many different Chilean wines as possible was to go to a great wine bar called Bocanariz (“mouth nose”). 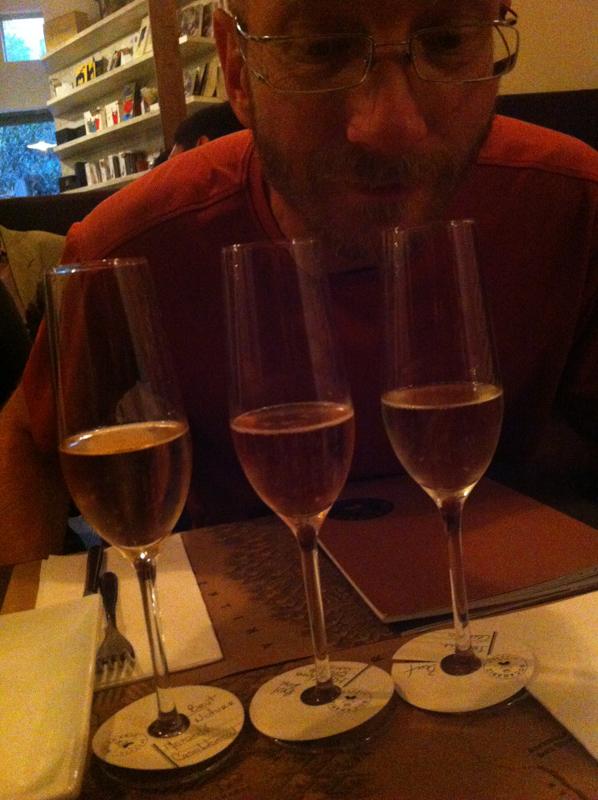 They have many wines available by the glass and also do tasting ‘flights’ of 50ml of three wines at a time. This gave us a chance to appreciate some of the great variety available. Bocanariz also has the added attraction that they do excellent food to accompany the wine – so good in fact that we went there twice, something we rarely do! 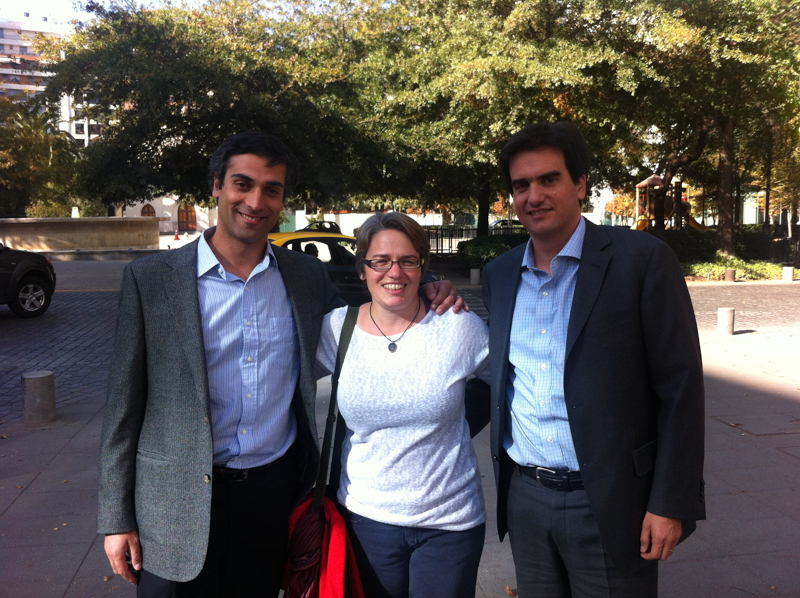 Another culinary highlight was lunch at the golf club with Felipe and Gustavo, who were in Becca’s MBA class at Oxford. Santiago also has the distinction of being a major centre for climbing in Chile, with many crags and mountains within easy reach. These range from cliffs in the Maipo Valley (one of the most well known wine regions to the south of Santiago) to a city crag (El Arrayán) near where we were staying with Andrew and Wendy. We visited El Arrayán for an afternoon and took in a couple of days at one of the major sports climbing venues, Las Chilcas, on the way to Valparaiso on the coast. These were the first two places on our trip where we have seen lots of other climbers and even had to queue for the routes that we wanted to do. This is probably down to the fact that the crags are quite small and, for El Arrayán in particular, the annual University of Chile student strike meant that they weren’t at lectures that Thursday afternoon! We carried on west from there to the coast to visit Valparaiso. This is Santiago’s port city and it’s chaotic, higgledy-piggledy nature that gives an insight into the once very rapid growth of the city as a new world trading centre, followed by decline, largely after the opening on the Panama canal. The old centre is now a bohemian, arty, but also run-down place (think of the Left Bank in Paris in it’s heyday and parts of East Berlin), particularly famous for its ‘ascensors’ (cliff tramways to get people up and down the steep hills), it’s colourful street art and resident artisans, musicians and poets, which we spent a day and evening wandering around. 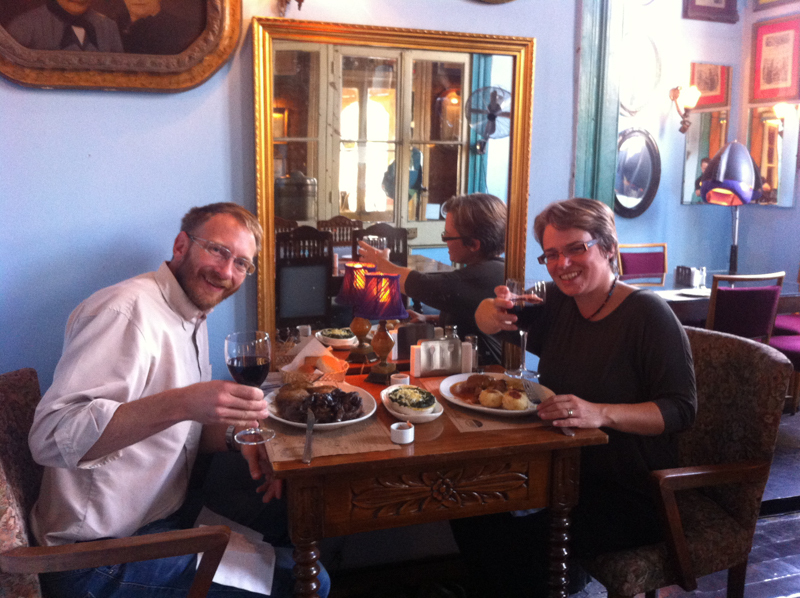 We ate in a delightful, very small restaurant, which sourced their wines from small local vineyards. Graffiti that says it all! Our other appointment on the coast was a visit to the yacht club up the coast a little in Concón to meet a technician there who could take look at our faulty campervan heater. Christian was very patient with our language barriers, helping to explain potential problems with drawings of scraps of paper when words failed us, and, although it took a return visit that involved us driving back across the country to the coast from near the border to Argentina, he got it working thanks to a little reconfiguration of the air inlet and outlet pipes. We were very soon very grateful to have a good heater in the van and we continue to thank him regularly when we turn it on on very cold mornings! From here, at the end of May, we crossed the Andes back to Argentina, making our first high level crossing through the Paso de Los Libertadores, which reaches around 3,400m at it’s highest point and passes near to Cerro Aconcagua, which, at 6,960m, is South America’s highest peak. Given that we have plans to spend much more time at high altitudes later in the trip, we were pleased that the van took this journey in its stride with no trouble. The pass was very dramatic, with the road steeply climbing up the Chilean side via a staircase like series of switchbacks full of heavy lorries creeping their way up and down, then making a much more gentle, long decent on the Argentinian side back into the desert. The border crossing here is a busy, but efficient one, with the formalities being completed on a drive-through basis. Patient and friendly (our experience) Argentinian customs officers ask all the returning Argentines what they have bought. Imports are strictly controlled, as part of the countries economic policies, and what individuals can bring in is also subject to complicated controls. Although the basic cost of living, with basic food good etc., being cheaper in Argentina, other “things”, consumer purchases (electronics, clothes, equipment, luxuries, etc. ), are cheaper, with a wider range of options available, in Chile. We stood behind a lady who explained she had been to Chile to buy a birthday present for her husband. The expat community in Bariloche fondly refer to Chile as “promised land” and regularly do shopping trips across the border. This made us, thankfully, relatively uninteresting to them. 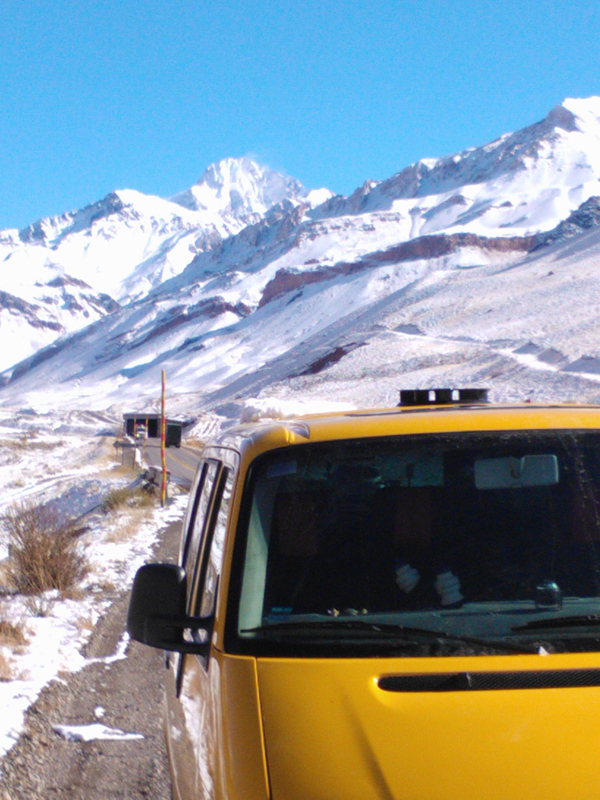 We stayed the night near the top of the pass in order to stop and look at Co. Aconcagua the next morning. When we woke, we noticed that we hadn’t heard any heavy lorries going past down the road, which was strange given the border reopens at 6.30am each morning, and when we looked out, we found we had caught the first snow of the winter! Fortunately it was only a few inches and we were quite easily able to clear the van and get ourselves back onto the road from where we were parked, and the lorries were soon lumbering up and down again. The Argentinian wine capital, Mendoza, just over the other side of the Andes from Santiago, is quite a contrast to Santiago and Valparaiso. It lies in the plains below the mountains, at around 900m altitude, and only has fifteen days of rain a year. This results in days that can be gorgeous, but also nights, especially at this time of year (coming up to mid-winter), that can be very cold. This temperature variation and the lack of rain (with watering of vines by tightly controlled irrigation) are two of the things that makes for great grape growing. However, the lack of rain and general desert conditions also means that there can be a lot of dust about in the air, which is occasionally exacerbated by the “Zonda”. This is a warm wind that blows from the Andes when it rains in Chile and when we experienced it, the night temperature was 25oC, rather than the usual 12 – so strange was the warm wind that our overlanding friends staying in the campsite with us sent us a message to ask if we were testing our our newly fixed heater and, if so, please could we turn it off! 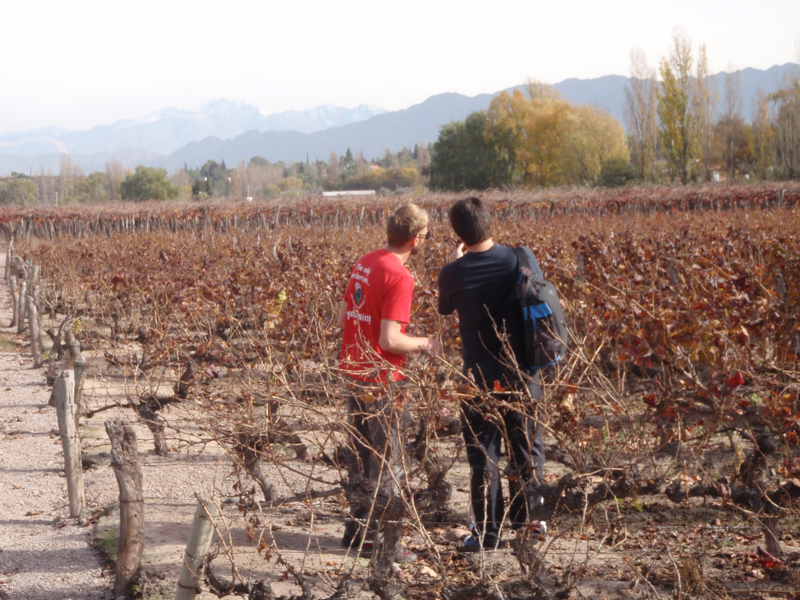 Many of the Bodegas (wine producers) in Mendoza are located in the suburbs around the city, making them rather more accessible from the city than those around Santiago. Despite this, for a wine centre, it is actually quite difficult to try lots of different wines. Many Bodegas don’t take visitors and, those that do, need you to make a reservation beforehand, which means that practically speaking, the best option is an organised tour. We did one by bicycle, a popular option here, taking in three very different wine makers, ranging from extremely small (Carmelo – a fascinating Italian one-man band producer who believes the quality of the wine is all in the cork and being aged, upside down in the bottle) to one of the biggest in Argentina (Nieto Senetiner). There was reputed to be one wine bar, The Vines of Mendoza, in the city centre that was a proper wine bar with lots of wines to taste, but, unfortunately, it closed three weeks before we arrived and other options were limited as people, generally, buy wine by the bottle with meals – buying wine by the glass is not something that has caught on out here yet. With a bit of asking around, we did manage to find the new kid on the block, the Cantina Wine Club, which had just opened up. We spent a pleasant few hours there, with our friends from our Antartica trip, JP and Hannie, with the English speaking (but off duty) manager giving us an interesting Malbec tasting (with wines differing by age and time in the barrel) . The climbing, by contrast, was a lot easier to find, both via a guidebook and the internet. We found a lovely sport climbing spot (Potrerillos) that had the sun on it all day (a great winter crag), where we could park up and camp right next to the crag. It was so inviting that we returned to it a couple more times while we were in the area. 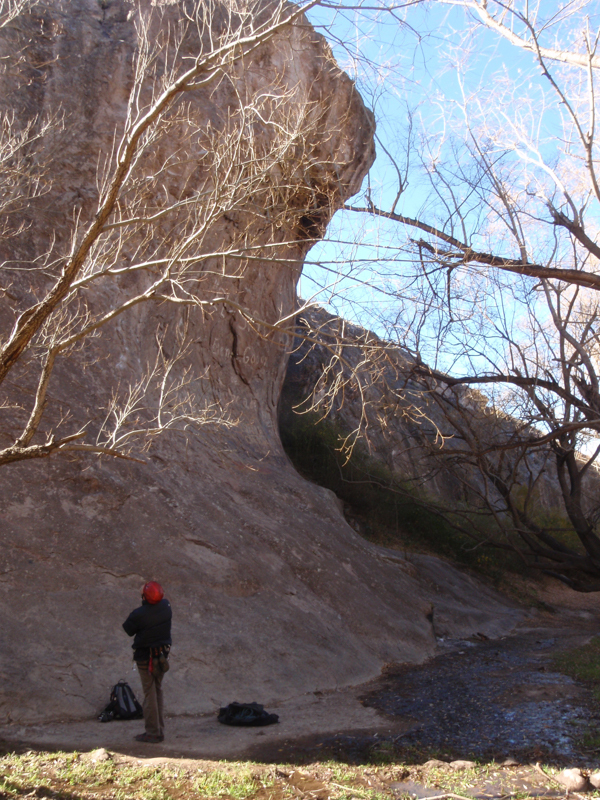 We also did a little climbing at a couple of other sport venues: El Salto, which was great but cold as it is south facing, and Valle Grande, near San Rafael, where we also took the opportunity to catch-up with our fellow PanAm VDubbers, Paula and Jeremy, who were staying in the area. Thanks for having us stay! Our climbing disappointment was the major area of Los Arenales, which is one of the best destinations in Argentina, but, since it is at 2,500 meters altitude and the first snows of winter had just arrived, was far to cold for us to climb! However, driving there to find that out did mean that we drive right past the front gates of The Vines of Mendoza (the same operation that had recently closed their city centre wine bar), which is an interesting Bodega to visit. They sell 1-4 acre plots of vines to private individuals, then manage the vines and make the wine on their behalf. It also has the restaurant Siete Fuegos (Seven Fires) on site, which is one of the best in Argentina. The wine tasting there was really interesting , as we tried some of their own wines, which they make from the leftover grapes from the various small owners, along with some from their clients, and the food at Siete Fuegos afterwards lived up to its reputation! Chile in general was rather a contrast to Argentina when we first arrived and the signs of wealth, availability of goods and greater population density was a refreshing change when we arrived in Santiago. 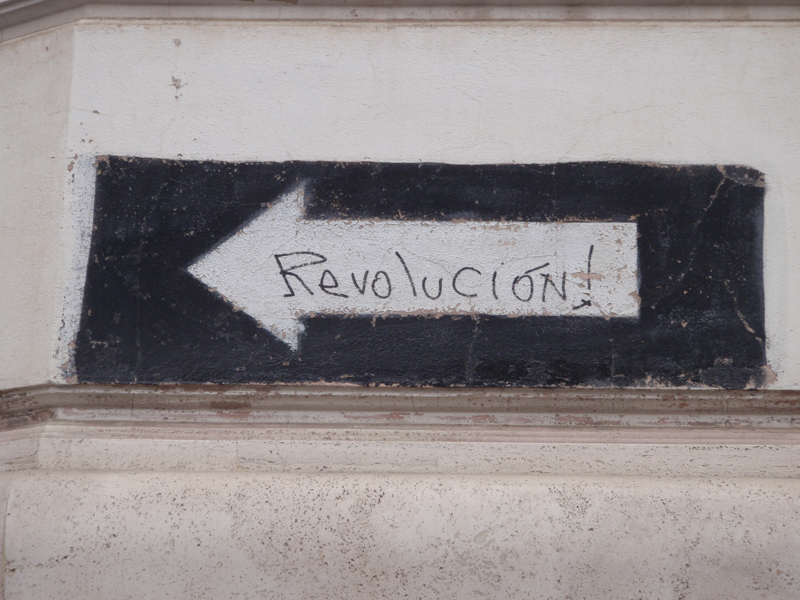 Our time in Santiago was like a city break spent in any European city. Although Argentina is suppressed by its long-term economic problems, giving most cities, including Mendoza, a feeling of faded grandeur, we did all the same feel a sense of comfortable return when we crossed back across the Andes. Outside of the Buenos Aires region, Argentina is much less populated and has a slower, more relaxed pace of life. We have grown rather fond of life in the open wildernesses. We had some of the best food of the trip so far in Santiago. Chile is fantastic for seafood but if you want a decent steak, stick to Argentina. 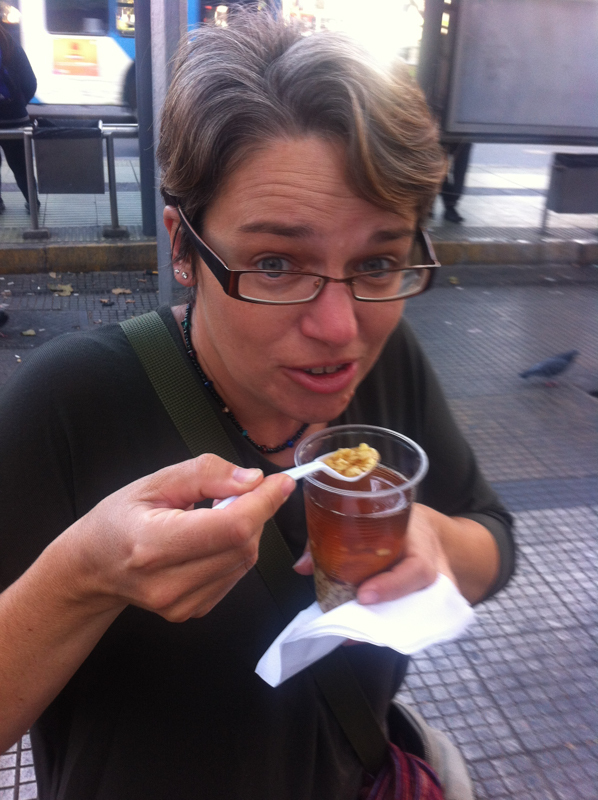 If you don’t like Sushi, avoid Santiago – it is everywhere at the moment. We went into one surburbian plaza with five eateries around it, to find they were all Sushi restaurants! Mendoza is the first place in Argentina we have seen lots of MAMILS (“middle aged men in lycra”) – one of our favoured indicators of growing wealth in a society, probably because most of our time has been in Patagonia, which is a relatively poor part of the country. We saw lots around Santiago, on a wide range of good quality bikes, Chile being a much richer country these days. 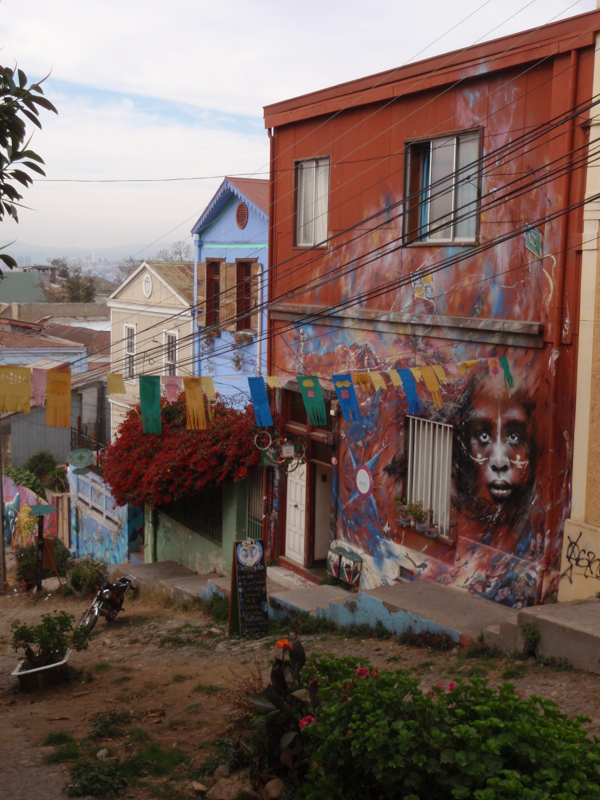 Old Valparaiso might be a fascinating place to stay, but we would be worried about the buildings falling down around us (we stayed in a new Ibis)! The wine regions in Chile are very complex and range from the coastal to high mountain, in the Andes. This, along with huge potential variation in weather patterns in climate, both with geography and from year to year, means that the same grape can taste very different depending where and when it was grown. This makes it all very interesting but a bit confusing. Our general impression is that in Chile, they do the major grape varieties very well but we learnt to keep away from some of the more obscure ones. Personally, neither of us were really convinced about Carmenére as a grape variety on its own. Argentina, on the other hand, has less complexity as most of the vineyards (1,000 out of 1,500) are around Mendoza, with most of the rest north up to the province of Salta. All are at an elevation of 1,000m or more and conditions are generally consistent year on year and so the wines are reproducible. We have had fewer wines that we didn’t like in Argentina than in Chile because of this. Malbec is what the region is justifiably famous for and there is a huge variety to choose from, from fresh, fruity and almost sweet to much more complex powerful wines aged in oak. Wine is generally drunk very young and there is only a very small market for wines aged in bottles. However, they can age well and we lucked out finding a 2009 bottle of Cabernet Sauvignon in a supermarket that tasted like a really good old world wine. It was the same price as the current 2013/14 stocks. The city crag of El Arrayán on the outskirts of Santiago – busy with students on a weekday afternoon, perhaps because the students were on strike that week! Las Chilcas is a surprising venue for the most important sport crag in Chile. It is on a major highway, which is currently a construction site and there aren’t really that many routes. 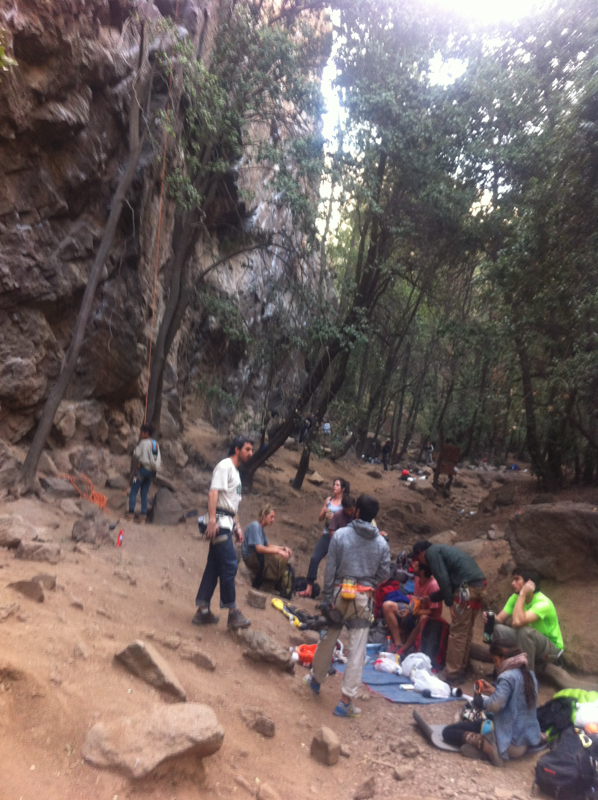 Perhaps this is both because climbing is a relatively young sport in Chile and they are still developing the crags. Plus much more land is fenced in and privately owned, meaning many great-looking crags are actually on private land. However, the crags in Chile were also the busiest we’ve been to so far, with a young crowd of keen sportspeople, so there is plenty of potential for it to develop further. In general, climbing is better developed in Argentina, where they have been out on the rocks since the 1960s. Much of the climbing is within National Parks or Reserves, where managed enjoyment of the land is encouraged, or, indeed, on open land. 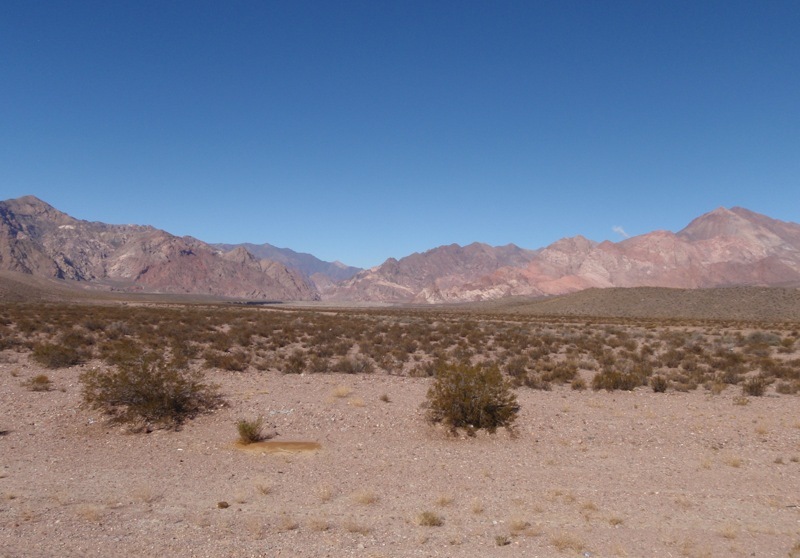 But then, Argentina is much, much less densely populated, with many wilderness areas. Here are some more pictures from this part of our trip. As before, click on one to open them into gallery view. Looking towards the financial district and the Andes beyond – through the smog! Smog does produce colourful sunsets! Settled in with the animals! … but she took a look around and decided it was a little too small for her. We spent the night parked in the middle of the roadworks! The grandeur of the naval building by the front is in stark contrast to the chaos on the hills above! This boardwalk between levels has a slide built into it! The reconfiguration of the air pipes meant a change in position of the hot air outlet, which meant the panelling no longer fitted. No worries – Becca had a Blue Peter moment and fashioned a new bit of “panel” out of card and an old pair of jeans! But Bruce soon had them under control! Thanks for the lovely lazy Sunday parilla JP! The most climbers we saw in one place in Argentina – but then it is a winter crag, and it was winter! The gorge at the top of the Valle Grande – somewhere down there is a gorge! Looks like beautiful climbing, but it was in the snow and the customs officials (it’s near the border with Chile) had closed the road beyond this point – no climbing here in the winter!